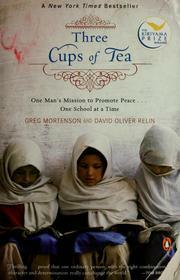 I am so glad that I finally got around to reading Three Cups of Tea: One Man’s Mission to Promote Peace… One School at a Time, by Greg Mortenson and David Oliver Relin. This book tells an incredible story, one that is well worth reading. In the early 1990s, Mortenson made a failed attempt to climb the peak K2 in Pakistan. On the way down, he took a wrong turn that changed his life. He ended up in a small village, where the people took him in and offered him food and shelter. While there he saw that the children had no school, but made attempts to do their lessons outside on the freezing ground. He made a promise to build them a school, and since that time has built not only that school but many others in both Pakistan and Afghanistan. His courage and passion for this work is incredibly inspiring. The book itself is in the third person; essentially it is David Oliver Relin telling Mortenson’s story. It reads like a novel, with edge-of-the-seat gripping action, beautiful descriptions of the people and landscape, and many quotes from the individuals who work with or have been helped by Mortenson. I greatly enjoyed actually reading it and the time passed quickly while I read. Mortenson’s actions are inspiring, but the book is clearly his story, one that can not be copied. It is not as if any random person could waltz in to Pakistan, say they’re going to build a school, and be accepted in doing in. Mortenson’s grounding for all his work is in human relationships. He built a relationship with the individuals in the village first, and built the school second. While this makes it a story unique to him and his personality and strengths, it also demonstrates better than words ever could the importance of building relationships with other people, whether it is the neighbor across the street or a poverty-stricken family in a developing country. I have no doubt that Mortenson’s work in building schools where children can receive balanced, non-extremist educations, is doing more for peace in that region than all the bombs my government has shamefully dropped on them. His work particularly emphasizes educating girls and empowering women, and it is clear time and again that when the women in a village become empowered, the quality of life for the entire village improves. And when a village’s quality of life improves, the people in it will be less drawn to extremism. I think Mortenson should win the Nobel Peace Prize and I hope he does someday. I highly recommend Three Cups of Tea. Last night I started reading the book We Speak as One: Twelve Nobel Laureates Share Their Vision for Peace, edited by Arthur Zajonc. It was produced in celebration of the PeaceJam Foundation’s tenth anniversary. PeaceJam’s mission is to “create a new generation of young leaders committed to positive change in themselves, their communities and the world through the inspiration of Nobel Peace Laureates.” To this end, they have developed a teaching curriculum focused on the lives and work of twelve Nobel Peace Laureates. The curriculum combines learning about the lives of the laureates with service projects in the community and development of conflict resolution and problem solving skills. The curriculum aims to empower young people to feel that they can make a difference in the world, and to give them the tools to do so in a peaceful and non-violent manner. I watched a video on the page about the PeaceJam Juniors curriculum (ages 5-11) and found it very inspiring. The video focused on a school that had adopted the curriculum school-wide, and at one point the principle said that when she first came to the school there were a lot of fights and now, after adopting this curriculum, the violence is much lower. I myself am inspired reading the words of the Nobel Laureates in the book, We Speak as One, and I think PeaceJam is doing important work in exposing children to these inspirational individuals.